pharmacy online canadian pharmacy Food, Food, Food : A KL-ite weekend in Penang – Day 2 – Tea Time & Dinner | Penang Street Food | Penang Delicacies "penang food", "penang hawker food", "penang street food", "penang delicacies", "penang gourmet", "food in penang"
Arguably the best popiah on the island is found in Padang Brown Food Court. The seafood popiah is really juicy with chunks of fresh crab meat (an additional order) and the gravy from the sengkuang (jicama) is ladled onto the popiah to give it extra flavour and lubricity. 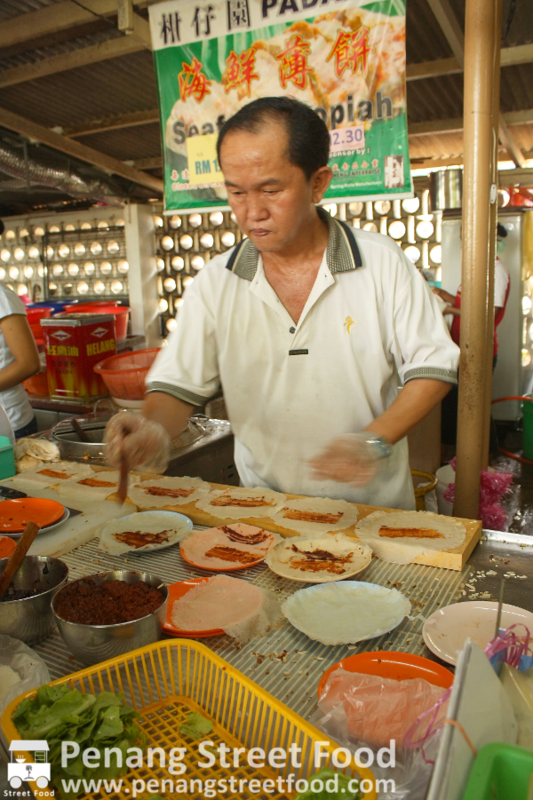 This stall is extremely popular with the locals so don’t be put off by the wait for your popiah. We had our tasty seafood popiahs to go. And to prevent the popiah from soaking through completely, they packet the gravy separately for you to add it to your popiah when you consume it. I had the opportunity to observe the popiah manufacturing line, which was a highly efficient machine with four hands. Mrs Ong separates the popiah skins, Mr Ong smothers some sweet sauce and chilli sauce onto the skins, Mrs Ong places a leaf of Chinese lettuce onto each popiah, Mr Ong distributes a dollop of sengkuang, Mrs Ong tops it off with a sprinkle of diced to fu and fried shallots, and if you had ordered the crab meat version, a bit of shredded crab meat, Mr Ong rolls the popiah and cuts it into inch thick pieces. The matriarch of the family then loads the tray and distributes the orders. They have it down to an art. 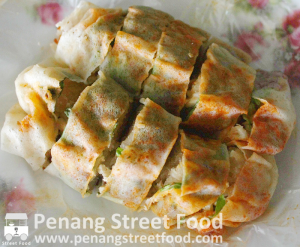 My only lament about the popiah is its price…RM2.30 per popiah with crab meat is almost equivalent to a bowl of laksa! We were still looking for the Mi Ku that Ms. Purple Hat was lusting over. For those who are unfamiliar, Mi Ku is a type of traditional Chinese bread which is pink in colour, normally used as prayer offerings for deities. 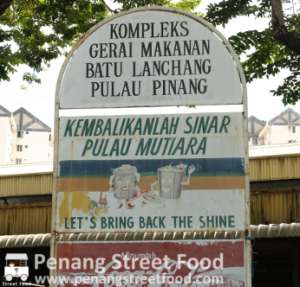 To quell this insatiable lust for Mi Ku, we headed over to the Batu Lanchang Market where there is an abundance of food stalls and from what I hear a good kueh seller which may perhaps have some Mi Ku. 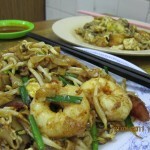 There is plenty of street food to eat here from Pasembur, Char Kway Teow, Chicken Rice and Chee Cheong Fun. The Char Kway Kak here even has a duck egg version. Ms. Purple Hat got really excited when I spotted a old lady with a packet of Mi Ku on her table while she was tucking into some Kway Teow. She bounded up to the lady to ask where she had purchased the bread. Unfortunately, the reply was that it was purchased somewhere outside the market, but she was kind enough to offer one or two to Ms. Purple Hat! Bless her soul. Despite being brazen, Ms. Purple Hat was too “pai seh” to accept the kind lady’s offer. So we continued combing the food stalls, and fortunately for us, this being the 15th day of the lunar calendar, we landed the last packet of Mi Ku! Yay, another wanna eat item off our list! Seeing as we were taking away street food for tea, we also took the opportunity to buy some Ondeh-ondeh, a Nyonya kueh variant, as well as steamed otak-otak. 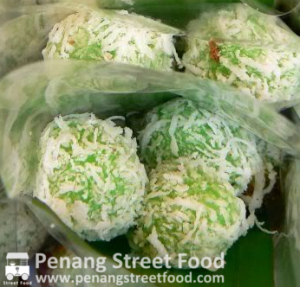 Ondeh-ondeh is a sweet snack made with desiccated coconut, rice flour and the fragrant extract of pandan (screw pine) leaves and filled with palm sugar. The tip here is to put a whole ondeh-ondeh in your mouth and burst it on the roof of your tongue. The sweetness of the palm sugar will “pop” in your mouth! Don’t attempt to take a small bite into the ondeh-ondeh unless you want to leave a mess on your clothes. 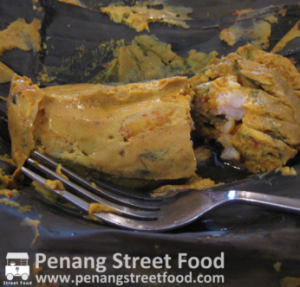 The northern take on Otak-otak – steamed fish mousse with spices, coconut milk, eggs and daun kadok (a type of creeping plant) wrapped in banana leaf – is more moist and more filling than its southern cousin. Without much thought, we had actually picked out a good mix items for tea…of sweet (ondeh-ondeh) and savoury (otak-otak), with carbs (Mi Ku), protein (the fish from the otak-otak) and fibre (popiah)! A really balanced diet…heh heh. Is it possible that these gluttons can eat some more? The answer is yes! After a whole day of indulging in street food, we thought it would be nice change to “dine properly”, by that I mean in a restaurant setting. There is no better treat for KL-ites than a good seafood meal. After all, it is the norm for KL folk to drive themselves all the way to Port Klang for good, fresh seafood. Our seafood restaurant of choice was Ocean Green, a respectable local joint on the beach front (a sliver of a beach) but with a George Town postcode. The highlight of our meal were the crabs. Yup, we had not one but two crab dishes that night! 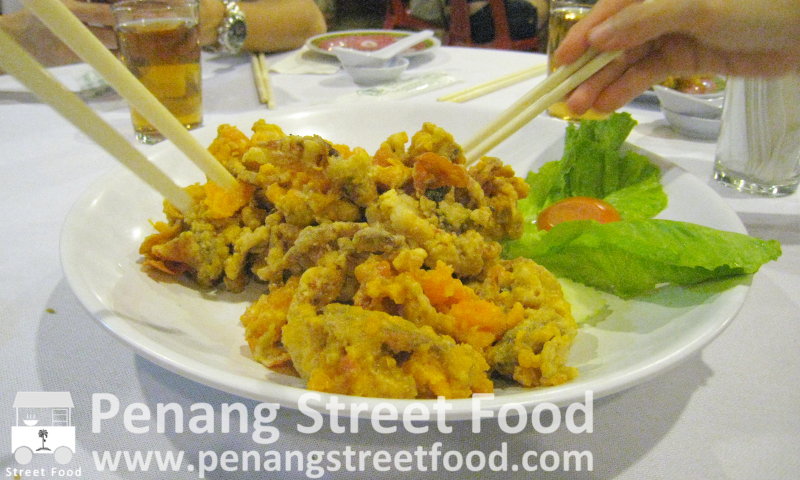 One was the salted egg soft shell crab, which is the BEST. It is lip-smackingly good, fried till crispy and golden, coated with salted egg, and served with a side of sweet chilli sauce. Excellent when washed down with a glass of red wine to balance the saltiness of the crab. This is my best excuse yet for letting my cholesterol rise for the night. 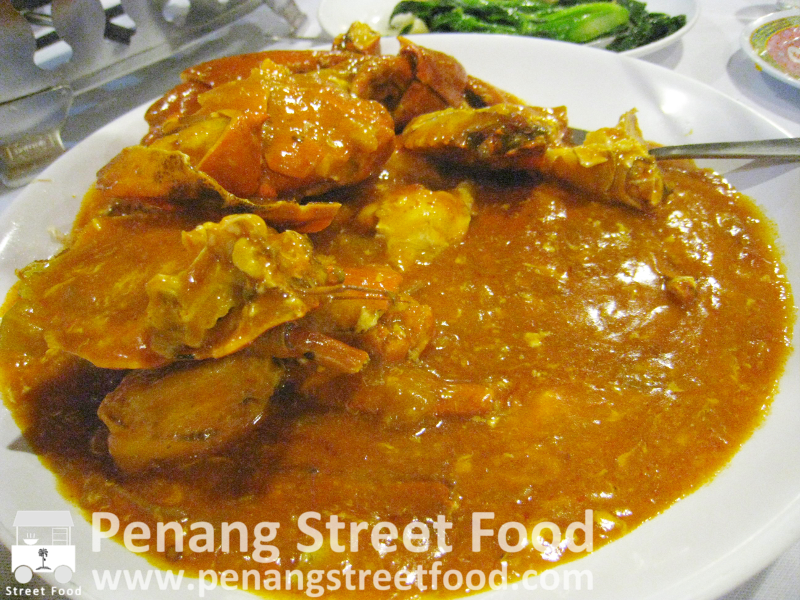 The other was the chilli crab with plenty of spicy gravy for dipping mantou! Reservations for dinner is recommended. 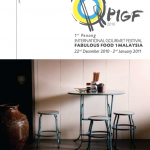 Ocean Green Seafood Restaurant (in front of Paramount Hotel), 48f Jalan Sultan Ahmad Shah, 10500 George Town. 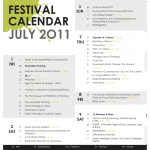 Tel : +604 - 2274530 / 226 2681 / 227 3649. Business hours : Mon – Wed 12:00 pm – 10:30 pm, Thurs – Sun 12:00 pm – 10:00 pm. 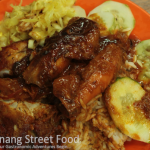 After the sheer amount of food we had throughout the day, I could not think of a better way to walk the meals off than to head to Batu Feringgi night market for a stroll. The Batu Feringgi night market is a staple attraction for foreign tourists. This market is filled with tourist souvenirs and knock offs from watches and handbags to Ralph Lauren Polo Shirts and Oakley sunglasses at RM 20/pair. The real attraction for locals is the cheapest “polycarbonate optical storage media format” in Malaysia at RM4/pop. The vendors even advertise their prices so there is no haggling worries. Malaysia Boleh? To wind down, we headed to the trusty neighbourhood cafe that never sleeps. 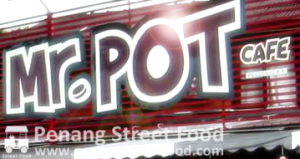 Get out of your hotel and take a stroll along Gurney Drive to enjoy the sea breeze and stop at Mr. Pot for a bite and a night cap. It’s strategic location along Gurney Drive will have you watching the occasional Mat Rempit, young lovers out on a date or Mr. Pot’s projection screens on football nights. The “Cham Peng” (iced coffee and tea mix) here will give Starbucks a good run for their money! 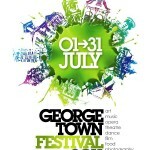 To bed, to bed…as the final day in Penang continues tomorrow.